Just 5 days to go until Plantworx 2015! Here at ND Brown we’re proud to be exhibiting at Plantworx – the UK’s dedicated working construction exhibition in Bruntingthorpe Aerodrome, Leicestershire. Plantworx takes place between the 2nd and 4th of June and is the largest live action construction show in the UK. As a CEA event it is organised ‘for the industry by the industry’. Visitors to Plantworx come from a wide range of industries including plant and tool hire, civil engineering, utilities, highways and demolition. It’s a great place to showcase our extensive fleet and services, and we’re excited to be exhibiting at this prestigious event. 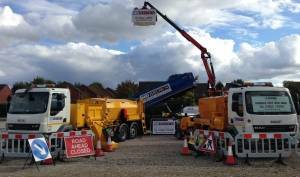 We’ll be using this opportunity to showcase our new Mercedes 32 tonne Muckaway tipper for self drive hire, and to launch our hot box training course run by central training services. We will also be showing a DAF LF220 (Euro 6) 18 tonne with twin champer hot box body and trailor – come and see this and our new Muckaway tipper in action on stand 3C11. If you would like to find out more about hiring our new Muckaway tipper, or any other of our HGV hire vehicles then please get in touch with a member of our expert team, who will answer any questions you may have. We provide hgv hire countrywide and our fleet includes tipper hire, hot box hire, tipper grab hire and cage tippers.